Samuel received under his fathers Will his books on law and copyholds in East Bergholt. His will dated 4 Oct 1752 was proved PCC 4 Nov 1752 by Edward Alston his nephew. His lands everywhere in Suffolk and Essex were left to Edward son of his late brother Nicholas. 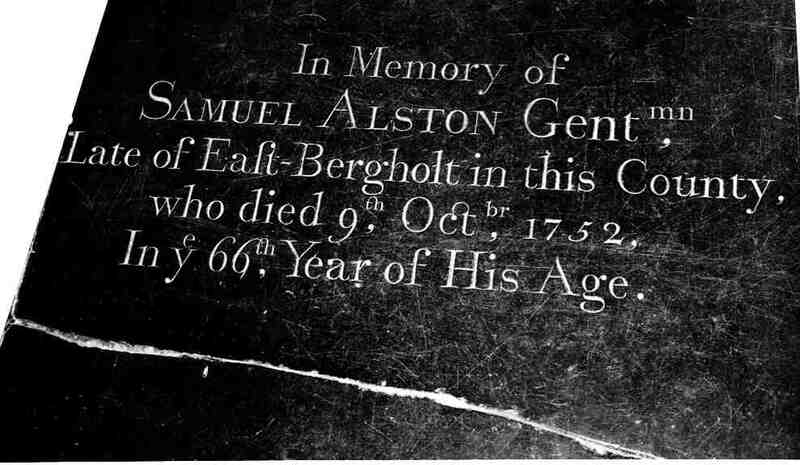 The Will of Samuel Alston of East Bergholt, co. Suffolk gentleman Dated 4 October 1752. Proved the 4th November 1752 by Edward Alston nephew of deceased and sole executor named in will. Within the Communion rails, on a black marble on the South Side.